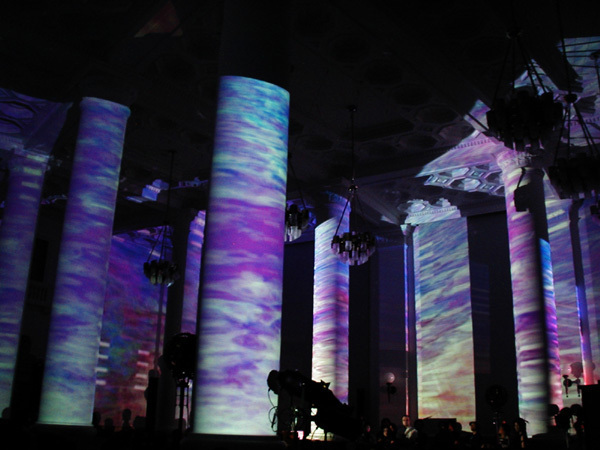 Spatial production, VJ, Graphic design, Installation, Video create, Stage arts, etc. Tokyo and London baced artist. Born in 1974. A motion graphics and spatial production artist. By treating projected motion graphics as streams of light, instead of projecting them onto flat screens in a conventional manner, they are sublimated into a new form of expression that freely dominate the space they reside in. 'Michi' studied installation and space produce in Musashino Art University in Tokyo. In 2001, 'Michi' started 'ku-ki', event based on collaborations between artists. 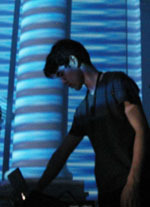 He began his creative activities at this event, where he participated in direction and motion graphic production. He usually collaborate with musicians and dancers. There are some sensational performances with his new style of visual and space works. The performance named 'sound+dance+visual' (presented by project suara) is one of much note. In August of 2005, [conscious -ISHIKI-], a performance produced by 'Michi', was held at Spiral Hall. It received much acclaim from various fields, for presenting a new type of environment centered on motion graphics. 'Michi' uses motion graphics not as something to be seen on a screen or monitor, but as a sensuous three dimensional form of expression. By producing spaces that cannot be contained within one person's view, through the use of multiple projectors, he attempts to create a form of visual communication that transcends the sense of sight. 'Michi' focuses on producing works that, within a frame of abstraction, require the audience to mold their own senses and construct questions, thus inducing a dialogue, instead of providing a form of expression that contains a preconceived explanatory answer.